This nationally acclaimed expert, Richard Lavoie, explains why some children may misbehave. He does so in this video through demonstrations and stories that apply to actual classroom and home situations. He uses the analogy of collecting "chips" (positive feelings) to help sustain children through the times and situations when their collection of "chips" may be lower. 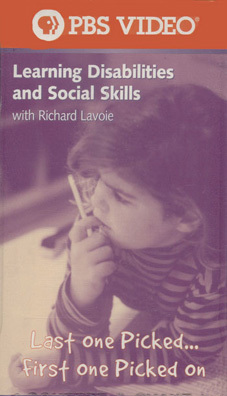 Lavoie provides concrete suggestions that will help parents and teachers resolve behavioral conflicts quickly, use preventive techniques to stop problems before they start, and create a stable, predictable environment that helps children flourish! Among the most valuable components are the suggestions for being proactive and identifying situations that may elicit problems --- before they start. A viewer guide is included. Parents, teachers and children will benefit from this bold new approach to discipline and motivation. It is especially valuable in providing strategies for helping understand the child with attention and learning problems.